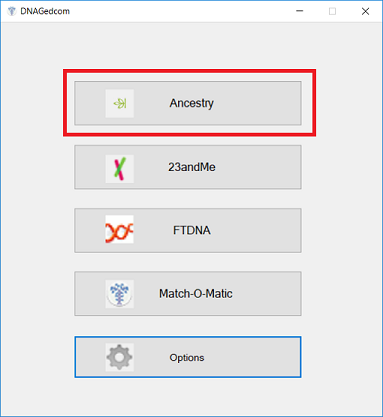 The first step in using RootsFinder's DNA Tools is to Create Your DNA Profile and specify that you will be using Gedmatch for your source (if you are processing through Gedmatch) or Ancestry DNA for your source if you are processing through DNAGedcom. RootsFinder doesn't process raw DNA data. We use spreadsheets created from your DNA data. 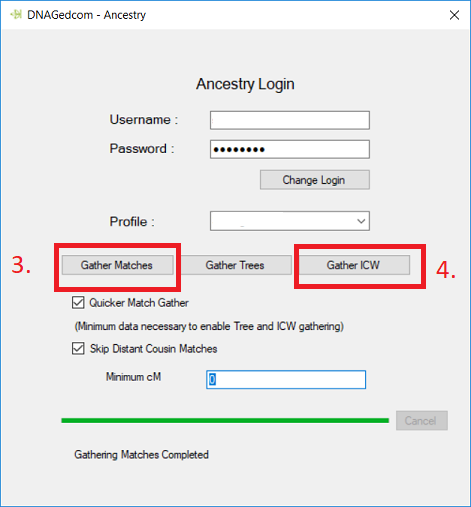 You will need to import your raw data to GEDmatch, or use DNA gedcom. 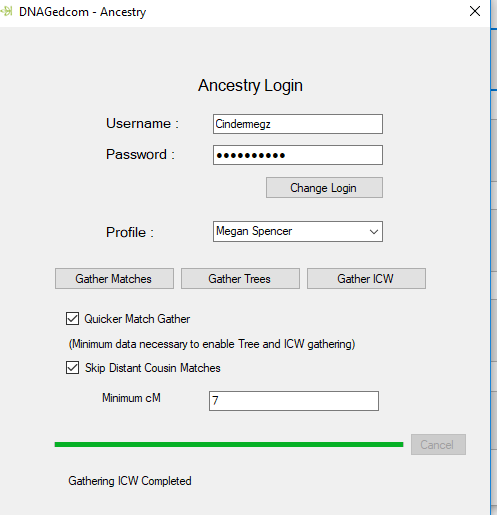 Either will use your Ancestry data to create spreadsheets. After you have created a Profile, you copy and paste those spreadsheets into RootsFinder. Ancestry does not export processed data. You have two options with Ancestry. 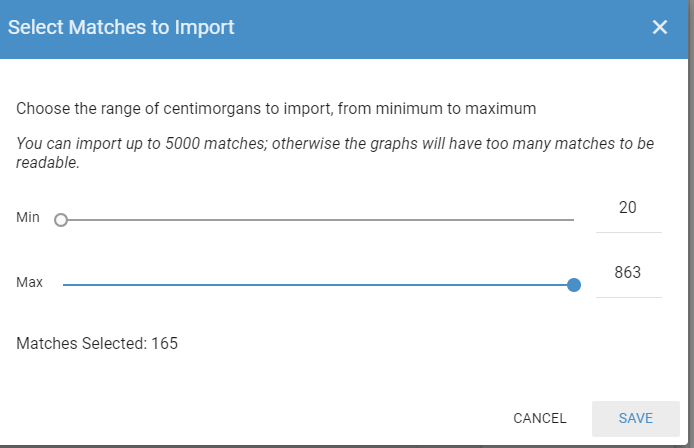 You may export your raw data to Gedmatch and they will process your data into exportable spreadsheets or you may use DNAGedcom. 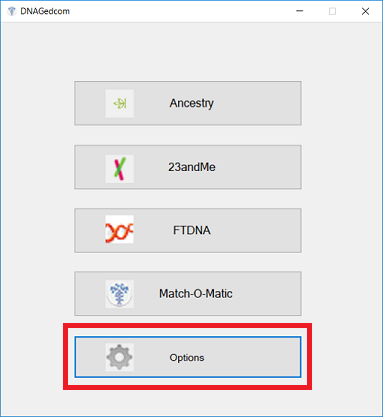 If you use Gedmatch, please select "Gedmatch" as the source in your DNA profile. 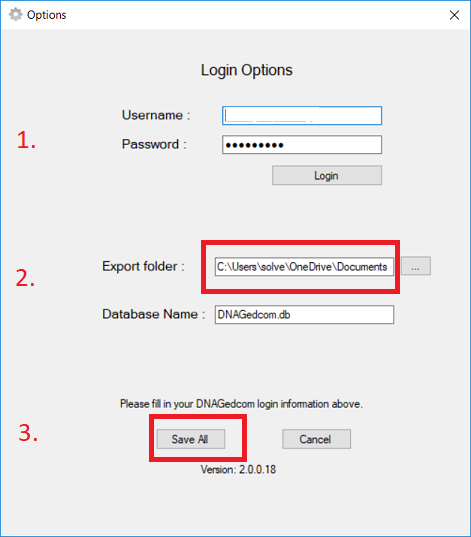 Click here to open DNA Gedcom. Register for an account. Once you have registered at DNA Gedcom you will get an email with a download link. Download the application and launch it. Make sure you know where the downloaded files will go! You can set this with the Options tab. Before you select a DNA source, click on "Options." Select a file folder for your DNA data. When you return to the main menu, select the DNA source you want to use. In this example, we will choose Ancestry. Use the same procedure for each DNA source. Check Quicker Match Gather and Skip Distant Cousin Matches. You can come back and get the others later. Then, click Gather Matches. This step takes a long time. It is best to let it run overnight because it will tie up your computer. When it is done, it will generate your matches file. Go back to RootsFinder and import the matches. Your downloaded file will have an "m" (for matches) at the beginning and will appear as "m_[your name]" in the export folder. Repeat the steps 1 and 2 and then select Gather ICW (In Common With). Set the minimum cM to 7cM. go get a cup of tea. Gathering this data will take time. Look in your export folder. The correct file here will start with "ICW" in the name. Return to RootsFinder and paste in your ICW file. 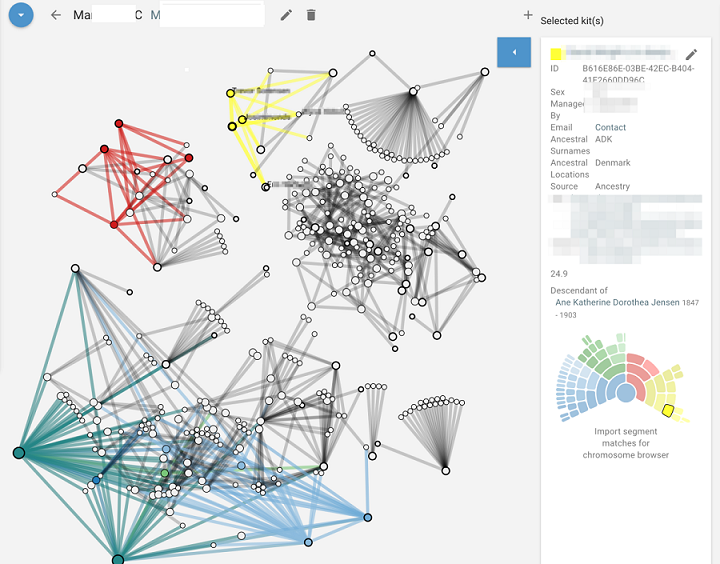 Here is a sample of a cluster view created with an ICW file. The information in the right panel is a combination of what Rootsfinder imports for you and info you have filled in. Clicking on the URL will take you directly to the matches Ancestry page. Other information can be added in the notes tab and this will show here on the summary. This side panel is one of the very, very good features of Rootsfinder. You can keep all your info in one place. In the left panel you can see I have recorded some of her ancestral names and locations, and noted that she lives in USA and is 97 years old. 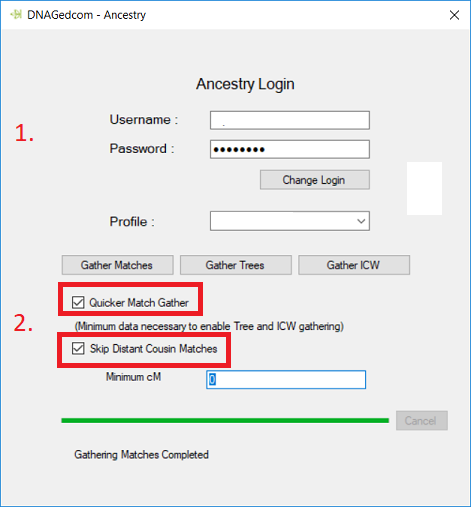 > Note: DNA Gedcom exports a match list and also ICW ("In Common With) matches, but does not export segments or triangulation matches. Sometimes, you may wish to limit your view to particular people or cMs. For step by step instructions, please see Setting Your Filters. You can also update your DNA data as new data becomes available. You can only update MyHeritage files with MyHeritage files, Ancestry files with Ancestry files, etc. What if the Spreadsheets Won't Paste? If, for whatever reason, you are having trouble pasting your spreadsheets into RootsFinder, please see instructions for using spreadsheets.